There are a ton of different deshedding brushes you can use to help break up your German Shepherd’s loose hair. 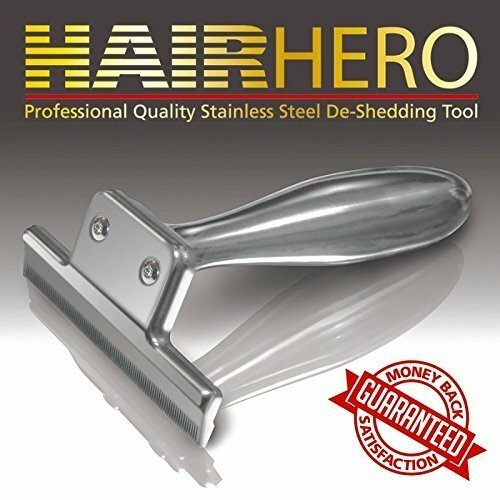 The Hair Hero deshedding brush aims to change how you get the loose hair and mats out with their solid stainless steel design, and long, non abrasive teeth. Solid Stainless Steel Handle: The handle on the Hair Hero brush is guaranteed to NEVER break on you, no matter how hard you’re pressing against it. Unlike wooden and plastic handles, the solid steel provides the perfect amount of weight to balance out the head of the brush, making it easier for you to manipulate through your dog’s coat. Ergonomic Design: The handle is also designed to fit perfectly into your hand, following the contours of your palm. While other handles cause discomfort in your wrist or fingers, the Hair Hero will alleviate the pain and discomfort, making it much easier for you to use on your dog to break up tough mats. Non-Abrasive Stainless Steel Teeth: The teeth on the brush will never rust, and maintain their sharp edge to help break up the loose hair in your dog’s coat. They easily remove hair without scratching against your dog’s skin, causing them irritation and making them run every time you pick the brush up to use it on them. Works Great On Long Haired Dogs: The length of the teeth, combined with the width of the brush head make it perfect for use on large, long haired dogs like your German Shepherd. You can make quick work of the loose hair, getting it done in a few minutes, instead of having to fight to keep your dog patient for a half hour or longer. Manufacturer’s Lifetime Guarantee: If you ever have a problem with the brush, you can contact the manufacturer for a replacement. The solid steel design means that you’ll probably never have to contact them, but the option is always there if you need it. Tends To Shave Your Dog’s Hair: If you continually run the Hair Hero brush over the same place, you’ll notice that you keep coming up with more, and more hair. This isn’t necessarily because there is that much loose hair in the area you’re brushing, but that the teeth are beginning to act like a razor blade, and are actually shaving your dog’s undercoat. To prevent this from happening, brush lightly in an area until you notice the hair coming out is getting thinner. Then move onto the next area that needs to have more loose hair removed. Shedding is a major problem with all German Shepherds. If you want to make quick work of the loose hair, and keep it from getting all over your house, clothes, or your car, you need to use a deshedding brush. The high quality construction and timeless design of the Hair Hero deshedding brush could be the perfect solution to your problem. You can learn more about it, and read reviews from other customers who have purchased it by clicking on the button below.